The legal rights of a dog bite victim and the remedies available for him or her, as well as the family that is affected by a dog attack. Practical, up-to-date information covering every state in the USA. 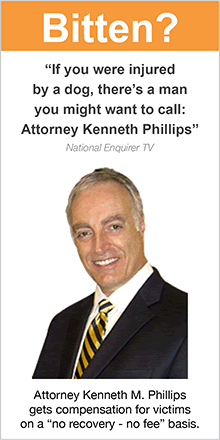 Learn it here or contact Attorney Kenneth M. Phillips for a free consultation. Tips and tricks, forms and templates, basic and advanced information for dog bite attorneys. Prepare your dog bite case in minutes, not hours, with practical, up-to-date information covering every state in the USA. Get lawsuit documents, deposition outlines, interrogatories and more, right here, or contact Attorney Kenneth M. Phillips for consultation services. The legal rights of dog owners and the remedies available for them. Find out what makes you liable for injuries caused by your dog. Learn about insurance for dog owners, and where to get it. Practical, up-to-date information covering every state in the USA. How to avoid liability for injuries to dogs and people. Get your medical bills paid if you are attacked by a vicious dog. Best practices for the dog trainer, dog rescue group, dog adoption organization, and animal shelter that will lessen your legal woes and keep your employees and clients safe. How to avoid liability for a tenant's dog. Learn what a tenant, or a visitor to your property, has to prove to hold you responsible for a vicious dog. Get a lease addendum that can protect you and your tenants from problems caused by dangerous dogs and irresponsible dog owners. Good in every state in the USA. Learn what kind of dog to get, and how to teach dog safety to your kids. Here's a quick and simple "danger scale" that will help to prevent dog attacks. Get good advice about choosing between a burglar alarm and a high risk dog. Model laws for the prevention of dog bites and the protection of dog bite victims. Dog bites are a serious health problem. There are approximately 5 million victims in the USA per year. Most of them are children.